Has this summer been a little strange for anyone else? We’ve had an extremely wet and cool summer here in Virginia and now that it’s finally September and, ostensibly, the ushering in of autumn, it’s finally starting to feel like summer. You know those cloudless days when temps reach the upper 80s, and the humidity is at, oh, 90%. In other words, miserable. Not really the kind of weather for soup. But when I tried out this recipe, it definitely was. Not one to simmer soup for a few hours (as the original recipe from Food52 instructs), I made this post-work one evening and couldn’t have been happier with how it turned out. A garden-ful soup, instead of using pantry and grocery items, I sourced almost all of it from my front yard: fresh tomatoes, kale, and rosemary. The potatoes harkened from a farm a few miles north and the stock from odds and ends I’d saved for that very purpose. The suggested fire roasted canned tomatoes, though, I’m sure would be delicious as well. To cut down on the cooking time, simply bring the entire pot to a rolling boil and lower to a gentler one and cook for as long as it takes for the potatoes to soften–maybe 45 minutes max. Then serve with some Earth Balance slathered hunks of bread and you’re good to go. Max flavor with minimal effort, that’s what weekday cooking is all about. In a large stock pot on medium heat, warm 1-2 tsp olive oil. Add the onion and saute until translucent, 3-5 minutes. Add garlic and celery, saute another 3 minutes until fragrant. Add the dried thyme, stir, and deglaze with the white wine. Add the rosemary on the stem. Add potatoes, chopped tomatoes, vegetable broth, and 1 c water. Bring to a rolling boil, then lower to a low boil. Cover the pot and let cook for at least 45 minutes, until potatoes are tender when poked with a knife. Remove the rosemary sprigs. Check the flavor, add salt and pepper to taste. When the potatoes are tender, add the kale, stir, and cook for 5 minutes, until the kale is soft. Remove from heat and serve with fresh bread. That looks so nice. I am so excited for fall soups! I am a soup fiend! I cannot wait to try this! Oddly, this is very much like what I planned to make for dinner tonight! Although I am definitely going for some white beans instead of potatoes, for super protein action. Summer is always weird in CA–it was 95F for the first week of June, and then hovering in the mid to high 70s for the entire rest of the three months–but it’s definitely getting to be time for kale at our house. 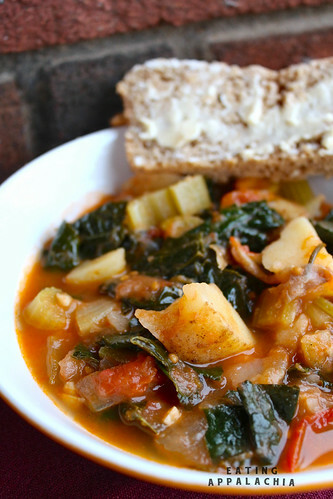 Awesome looking soup and there’s nothing better than super fresh veggies straight from the garden! I am filing this away for cooler weather or the next deluge. I just moved to Atlanta a month ago, and the most I am thinking about soup (other than dreaming about fall) is noting the hot, damp air’s striking resemblance to soup! You always have the best looking soups! Mr. Wing-It and I spent most of the summer traveling around several states and summer has been pretty much like what you described everywhere we’ve been. This silly heat needs to go away dammit! PS: Mr. Marmot McCutepants says HI!